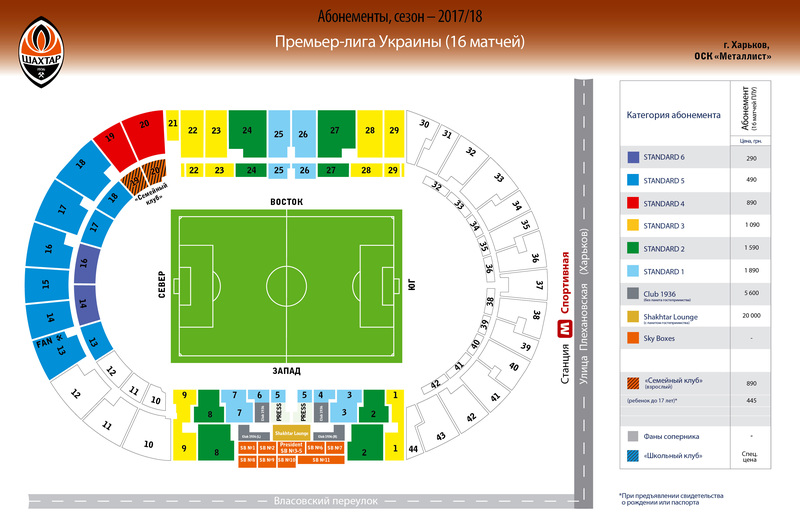 You can buy season tickets for Shakhtar’s home fixtures at the ticket office of OSC Metalist (from 9:00 til 20:00, no breaks) and online, on the official website of FC Shakhtar. When purchasing a season ticket, the fan should produce their passport or driving licence and fill out a questionnaire. The seats of the 2016/17 season ticket holders will remain booked through June 30, after which they will also go on general sale. 1. Discounts up to 20% on the Champions League tickets and packages (Shakhtar are participants in the competition’s group stage). 2. Priority to be the first to choose the best seats and buy tickets for all European club competition fixtures. 4. Saving time and money when buying tickets for all the games in the Ukrainian League (up to 30% of the aggregate ticket price). 6. Discounts of up to 15% on the Fan Shop merchandisedepending on the season ticket category. Call +38 044 498 13 88 to learn more about purchasing season tickets.